If you haven been thinking about insulating your garage door, but have been putting it off because it was too expensive, or would take too long, or just about any other reason, well, you just ran out of excuses. With this information you will see that garage door insulation doesn’t have to take a long time or cost a lot of money (or get your arms all itchy). There are a number of alternatives available for garage door insulation. Most of the following are probably the reason it has taken you so long to actually insulate your garage door. 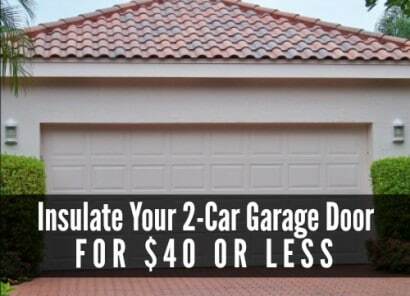 Garage door insulation kits – most are made for only a one-car garage door and they run about $80, so you would need two of those, at a cost of about $160. Duct wrap – duct wrap that’s large enough to cover a metal garage door section without piecing it together is not so cheap. Duct wrap usually comes in 10 foot rolls and a two-car garage is generally 16 feet across, so you would need the 24 inch wide rolls and you will need 7 rolls of it to insulate your door to the same R-value (that’s insulation-speak) as the method that will run you less than $40. These 7 rolls of duct wrap will run you about $250 – not a very cheap option in our mind. Insulation board – you’ll need 4 sheets at about $20 a sheet for a total of just $80. You will also need a truck to haul the insulation board home as it comes in large sheets. Although, if you don’t have a truck, you could always cut them at the home improvement center parking lot before you put them in your car.